The cairn commemorates the site of Major Mitchell`s camp in 1836. The cairn was unveiled in 1936, the centenary year of his explorations. 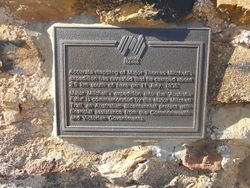 An additional plaque was added to the memorial during the Bicentenary celebrations in 1988. Miss G. J. Skurrie, head teacher of the Kanya State School, has brought under the notice of the Stawell Shire Council a proposal to erect a cairn at Kanya on the spot where Major Mitchell camped in 1836. The council has decided to undertake the erection of the cairn, and to ask the Kara Kara Shire to co-operate. Miss Skurrie is to be asked to supervise the erection. Horsham Times (Vic), 6 March 1936. A memorial cairn is to be unveiled at Kanya on Saturday. 18th inst., on the spot where Major Mitchell camped in 1836. From there Major Mitchell made his visit to the Grampians. The Age (Melbourne), 7 July 1936. 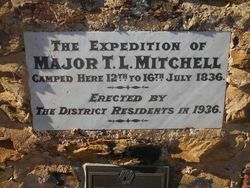 The expedition of Major T. L. Mitchell camped here 12th to 16th July 1836. Accurate mapping of Major Sir Thomas Mitchell`s expedition has revealed that he camped about 2.5km south of here on 11 July, 1836. 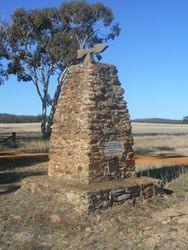 Major Mitchell`s expedition into 'Australia Felix' is commemorated by the Major Mitchell Trail, an Australian Bicentennial project with financial assistance from the Commonwealth and Victorian Governments.